In connection with the publication of the first-ever collection of poems by Bohuslav Reynek in English, The Well at Morning, the poet and translator Justin Quinn (Department of Anglophone Literatures and Cultures, CUFA) and the literary theoretician Martin C. Putna took part in an evening dedicated to literature during the Cold War and the translation of poetry. The Well at Morning comprises a selection of Reynek’s poems and several essays. Its aim is to introduce international readers to this extraordinary artist and to the cultural and historical context of his work. The volume also invites discussion about the reception of Reynek, a European poet, in the Czech Republic. 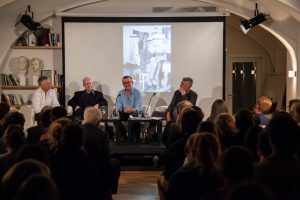 The evening was hosted by David Vaughan; the renowned poet Petr Borkovec and Justin Quinn read a selection of poems in Czech and English. The book is published by Karolinum as part of the Modern Czech Classics series.